Home » 2010 world cup , 2011 AFC Asian Cup , 2014 World Cup , Alberto Zaccheroni , Brazil , Gamba Osaka , Greece , Japan , Keisuke Honda , Shinji Okazaki , Yuji Nakazawa » Japan: Arrivederci Zac! 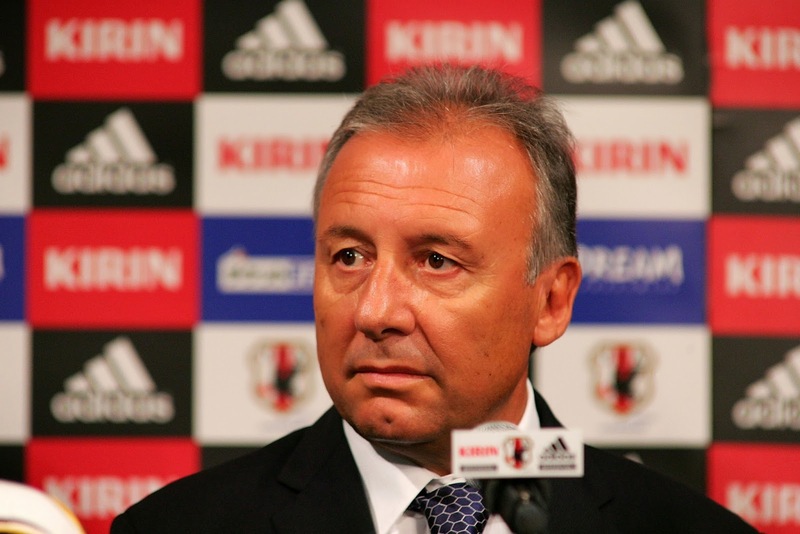 Alberto Zaccheroni’s time as Manager of the Samurai Blue has come to an end in extremely disastrous circumstances. Although it had been rumoured for some time that “Zac” as he is known in Japan, was due to step down from his position. Unfortunately for Mr. Zaccheroni he will leave a mixed legacy of extreme ups, but also quite low times. It’s a legacy worth reflecting on as Japan looks to the future though. On August 30th 2010 the JFA announced that Zac would replace the highly successful Takeshi Okada who had led to Japan to 9th at the 2010 World Cup in South Africa. Zac’s first task was to lead Japan out against arguably one of the best National sides in the world, Argentina, in his first match at the helm. Shinji Okazaki famously scored to give the home side the win. It was an incredible start to his reign and one that perhaps put the wheels in motion on the massive expectations the Samurai Blue would come under. 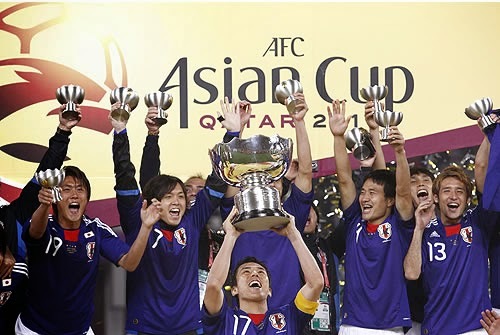 Zac’s next major success was continental supremacy at the AFC 2011 Asian Cup. It was at this tournament where a core of players had begun to become automatic choices for Zac. A few of these very players though were to become the undoing of Zaccheroni. During the 2010 World Cup, Japan had a few breakthrough performers like Keisuke Honda and Shinji Okazaki, but with them they had the central defensive pairing of Yuji Nakazawa and Marcus Tulio Tanaka. Zaccheroni had dropped both of these two players who had vast experience at club level as they had become in most peoples eyes as “too old” for 2014. While Nakazawa is currently now 36, he would have been quite an asset to be used as mentor to up and comers like Maya Yoshida. Tulio would’ve been 33 and quite an asset in physical ability as well as a utility front man if Japan needed a goal late on, like for instance versus Greece. Tulio has on many occasions won games for his side Nagoya Grampus in such fashion. Unfortunately this oversight by Zac led to a central pairing of Yoshida and Yasuyuki Konno whom spent his 2013 season in Japans J2 along with veteran Yasuhito Endo. As most J.League fans are aware Gamba Osaka are not known for their defensive abilities. The pairing of Konno and Yoshida conceded 7 goals at the 2013 Confederations Cup and also 4 goals against in one very forgettable match, that was twice the amount that Nakazawa and Tulio had conceded in the entirety of South Africa 2010. Zaccheronis successors to the wonderful pairing of Tulio and Nakazawa failed miserably. Ryoichi Maeda and Mike Havenaar enjoyed a considerable amount of time in Zac’s starting lineup only to be dropped. Havenaar, who ply’s his trade in the Netherlands, is considered by many to be a bad fit for Japan and I tend to agree with this assessment. The main problem with this though is that he wasn’t replaced with someone with equal qualities. Unfortunately for Zac perhaps his right hand man Hiromi Hara is largely to blame for not properly advising him that the J.League possessed more than enough talent to fill the Striker role. Although he was given an invite to a selection camp prior to Brazil, Kengo Kawamata, who had scored 23 goals in J1 in 2013 had only a slight chance of making the squad. This would also be the same fate for Yohei Toyoda who again like Kawamata is a clinical finisher at club level. Zac opted for Yuya Osako and veteran striker Yoshito Okubo. While this choice at the time was a feel good story for Okubo who had a renaissance year at Kawasaki, it meant that Japan were to sacrifice an aerial asset in Kawamata (6ft) for Okubo at a mere 5’6. While Osako does possess height, he was an absolute ghost at the World Cup and doesn’t possess the clinical finishing or the direct play of Kawamata. This would prove costly for the Samurai Blue as highlighted by the lack of dominance in the air versus Greece, a match that would prove to book Japan’s ticket out of the competition as Greece would win their last group game and go through in second in the group. Starting lineup selections, as well as untimely substitutions, were also prove to be a major player in Japans undoing. For this writer, seeing the talent that is Manabu Saito spend his entire tournament on the bench was infuriating considering the fact that he posses an uncanny amount of skill with dribbling the ball. Japan was in dire need of direct play into the oppositions box, Saito was exactly what needed for this kind of breakthrough. Hopefully Japan’s next boss will have understanding of the players he’s selected and what they can do for the team. It’s not all doom and gloom for Japan upon reflection on what Zaccheroni achieved at the helm. In Japan, the results of the 2010 Finals had caused a huge buzz and perhaps for the first time a sense that Japanese football was about to join the ranks of the top sides in the world. During Zac’s time in charge the likes of Shinji Kagawa, Shinji Okazaki, Mike Havenaar and many more were able to find teams to join in Europe and establish themselves among some of the best club sides on the continent. Comparisons by some that Zac Japans results mirror those of former boss Zico. While this is true in terms of the World Cup matches and AFC Championships, I think it’s perhaps a little unfair considering the quality of teams at Asia 2011 as well as the fact that Zac had quite an impressive record outside of FIFA tournaments. The rumors of former Samurai Blue captain Tsuneyasu Miyamoto will be succeed Hara as Technical Director are welcomed, it will be interesting to see what the direction the JFA takes as for the man they choose to replace Alberto Zaccheroni with. The AFC Asian Championship is less than a year away and it is time for a new man to lead Japan on to bigger and brighter things. This article was written by our special guest contributer Daniel Jones. Daniel is a huge fan of J.League soccer and the Japanese National Side.